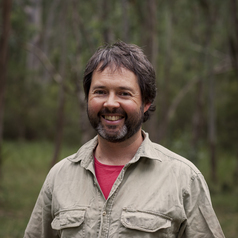 Ben Moore is a Senior Lecturer in Ecology in the Hawkesbury Institute for the Environment at the University of Western Sydney. He studies plant-herbivore interactions and asks how plants avoid or tolerate being eaten by animals and how animals that eat plants cope with the nutritional and toxic challenges that plants present. His research spans the fields of plant ecology, animal ecology and chemical ecology and considers a variety of species, but he has particular experience with eucalypts and the marsupials that eat it.